Hundreds of anarchists rioted in the French city of Nantes, showering the city with smoke barrels and paint bombs in defiance of the state of emergency, which was extended by the French parliament for another three months. 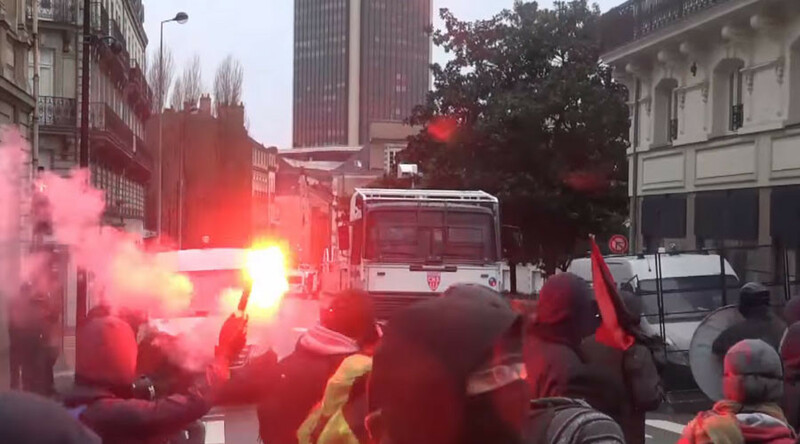 Protesters waving red-and-black anarchist banners set off fireworks, threw paint and smoke bombs at bank facades, as they rampaged through Nantes on Saturday. Riot police officers cordoned off the streets in a bid to prevent further escalation. One of the protesters hurled a firework at a group of police officers, but, as seen in the video published by Ruptly, the projectile missed the target. The radicals, armed with homemade shields, held a banner, reading, “Resistance to the state of emergency!” The state of emergency was invoked in France following terrorist attacks in Paris on November 13, 2015, in which 130 were killed and 350 injured. The extension of the exceptional measure enables police to put anybody under house arrest without obtaining a court order. Law enforcers can also conduct searches without warrants. Since its implementation in November, more than 3,000 searches have been carried out and nearly 300 people have been placed under house arrest. Last month, France saw a string of protests across the country calling for the immediate abolishment of the state of emergency. Protests were also leveled against the government’s plans to revoke the French citizenship of dual citizens convicted of crimes related to terrorist activities. "The state is allowing itself to take absolutely catastrophic decisions for the life and future of the liberty of France," Youssef Boussoumah, a member of the Indigenes de la Republique party, told RT's Ruptly video agency at the time. The move has also been severely criticized by various human rights groups. They argue that it hinders the exercise of fundamental freedoms and infringes on people’s rights. Human Rights Watch has published a report titled: “France: Abuses Under State of Emergency”. It accuses the police of abuse of power in carrying out searches and arrests. “Police burst into homes, restaurants, or mosques; broke people’s belongings; terrified children; and placed restrictions on people’s movements so severe that they lost income or suffered physically,” the report reads, urging the repeal of the measure and to halt discriminatory police practices.